Have you ever considered opening a restaurant and realized the cost is enormous and the competition is steep? This doesn’t necessarily mean you have to bury your dream. A great alternative to attempting to own and manage a restaurant is opening a food cart! If you live in a high population city you’ve probably passed food carts somewhere along the way. They tend to pop up in little pods and attract the locals on their way to and from work and on lunch breaks. Food carts require only a fifth of the investment of a restaurant and make great returns. With added flexibility, exciting options, and a fun atmosphere, owning a food cart is a little less like work and a little more like play. 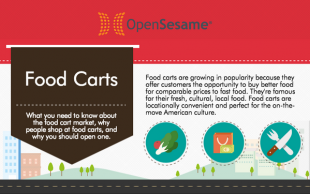 This infographic will give you an idea of how successful food carts can be, and Gourmet Streets courses can make it easy for you to open one successfully. The Gourmet Street courses cover hiring and managing, laws and regulations, operations and administration, customer service, and daily operating procedures. Food carts are popular and incredibly profitable. If you know what you are doing you can open a highly successful food cart and start making money asap!